Taste & Tell is one of several Signature programs in our Memory Support neighborhoods. It’s a culinary collaboration between the activity professionals and community Chef, and creates an opportunity for these two creative departments to come together and coordinate a food related program that touches the heart and soul of those we serve. This distinctive Signature challenges our team members to design a culinary experience that infuses our 6 Principles of Well-Being philosophy into one unique program! It’s magical to see the Chef engaging with the participants as they jointly reminisce about a recipe, kitchen gadget or cast-iron skillet. It’s inspiring to see folks with Dementia working side by side with the Chef mixing the meatballs or assembling the fruit kabobs! Taste & Tell is an opportunity to bring folks together to learn, laugh and share memories over sweet and savory food items. We’re proud to show you the amazing video and photo highlights from our Taste & Tell program. Enjoy! Taste & Tell is an interactive, hands-on experience that we're proud to share with our Memory Support neighborhoods. This video follows a community team through a Taste & Tell event and explains the benefits of the program, step by step. 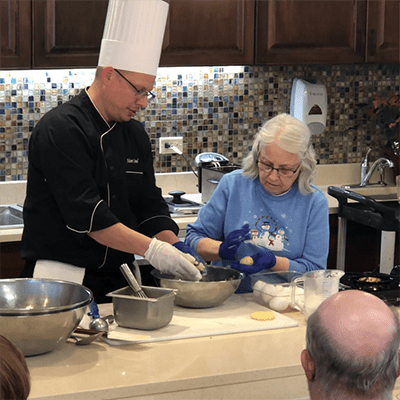 Working side-by-side with the community chef and each other gives residents the chance to polish their kitchen skills while learning something new. 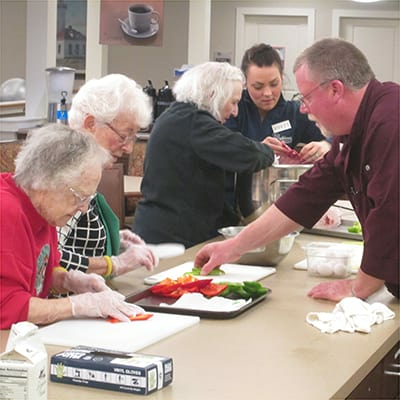 Residents in Lighthouse Memory Care in Anacortes, Washington worked with their chef to make a tasty Salisbury Steak recipe. Sometimes, Taste & Tell themes focus on one common ingredient. In this case, it's potatoes! Residents at Brookridge Heights in Marquette, Michigan made a variety of recipes that featured the potato as the main ingredient, including potato pancakes, pictured here. Another common element of Taste & Tell events is mixing flavors and textures. 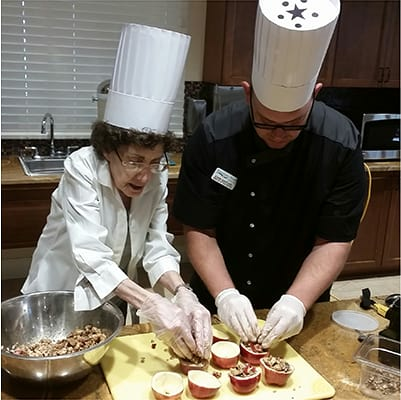 Residents at Symphony at Stuart, in Stuart Florida, worked with their community chef to make crunchy, creamy, salty, and sweet stuffed apples. Yum! Our signature Taste & Tell program is making the news! Brookridge Heights in Marquette Michigan had their Taste & Tell event covered by TV6 & FOX UP.